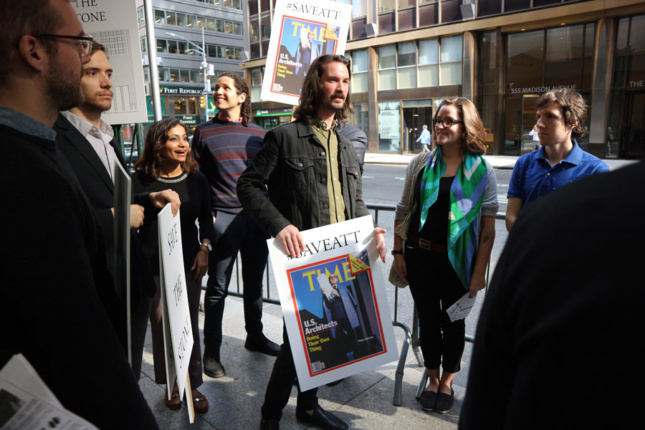 Today New York’s architecture community came out in force to protest planned renovations to the base of the AT&T Building, Philip Johnson and John Burgee’s iconic postmodern tower. 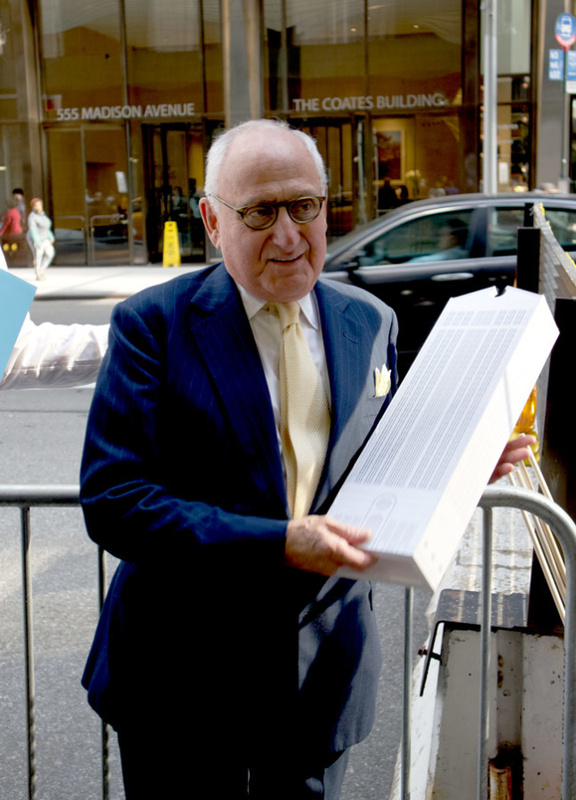 “We’re on for a photo op, where I cradle a model like Philip Johnson did on the cover of Time Magazine,” said Robert A.M. Stern, cradling a model of the AT&T Building that RAMSA crafted for the occasion. 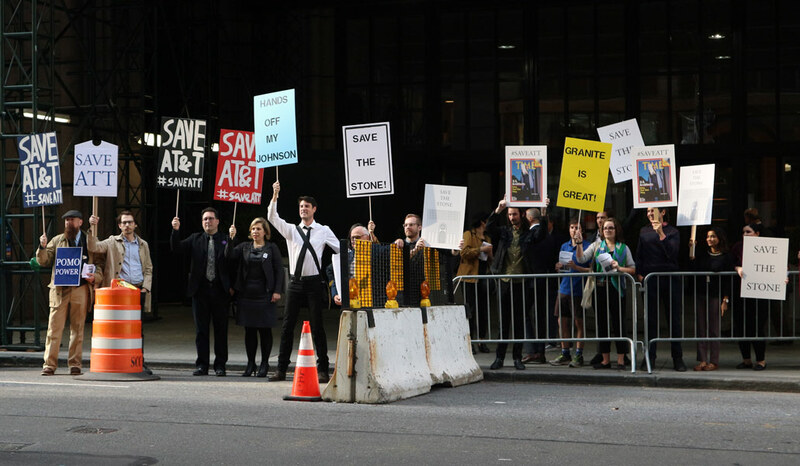 Stern was accompanied by a coterie of designers from his firm (“my young people!”), all carrying blow-ups of the cover or “Save the Stone” posters. Architects, curators, and members of nearly all the city’s major historic preservation groups were in the streets snapping pictures of each others’ signs and discussing the cheeky granite tower beneath scaffolding, a sign of renovations that have stirred the ire of preservationists and postmodernists alike. 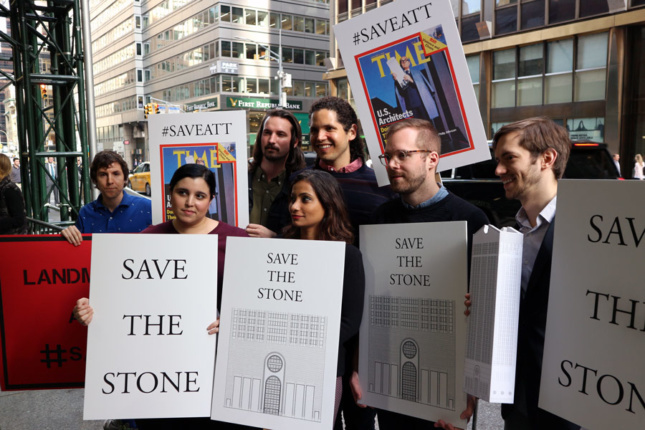 The protestors, about 20 strong, were responding to a Snøhetta design released this week that would modify the ground floor public spaces and glass over the building’s arched stone entry. 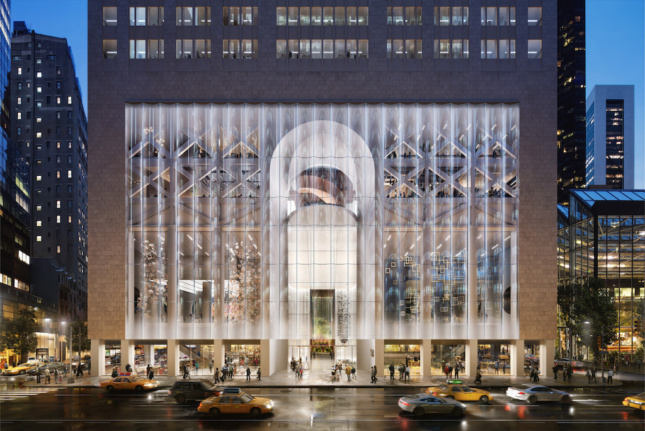 Renovations would add a larger garden connecting the building, now known as 550 Madison Avenue, to nearby 55th Street, while a multistory glass wall would make retail spaces visible from the street. After hearing the news, filmmaker and modern architecture lover Nathan Eddy organized a protest on Facebook and put out calls to action. Already, his change.org petition to the Landmarks Preservation Commission (LPC) to save the building has garnered almost 800 signatures. (Although Landmarks considers public testimony submitted through its channels, this petition is not the first official step in the landmarking process.) A few days ago, however, preservation activist Thomas Collins took that first step by submitting a formal Request for Evaluation to the LPC to designate the AT&T Building an individual and interior landmark. Since it was commissioned by AT&T in the early 1980s, the building has churned through owners. The latest, Saudi Arabian investment group Olayan America, bought the 37-story property for $1.4 billion in June 2016 with plans to convert it into offices. (RAMSA was brought on board by previous owners to turn the vacant building into luxury apartments.) This is not the first time the building has undergone substantial renovations, either. In 1993, then-owner Sony commissioned Gwathmey Siegel Kaufman to enclose the 60-foot-high north and south arcades in glass to create two retail electronics stores for Sony products, a significant rework and reduction of the building’s privately owned but publicly accessible spaces. Today, scaffolding surrounds the building, and workers were painting sheetrock in the lobby, which is closed to the public. The protest was tight-knit but attracted the attention of a few passerbys, including Noel Robichaux, a worker at the old Four Seasons restaurant who followed the restaurant when it left its Johnson-designed home last year. 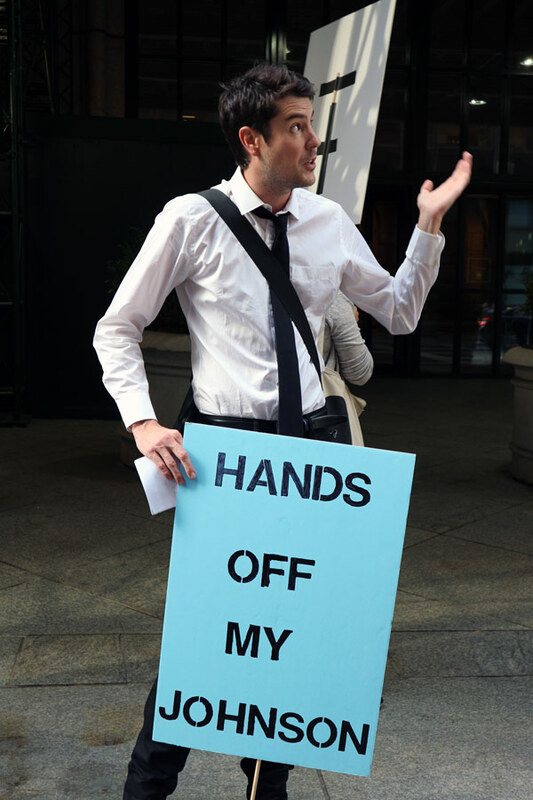 Robichaux hadn’t known about the protest in advance, only noticed because he was passing by and said that he thinks it’s “interesting that Phillip Johnson’s work is under attack across the city,” with two iconic buildings being assailed in such a short time. Although it wasn’t present at today’s event, the Municipal Art Society (MAS) is in talks with Snøhetta about the design. “We have significant concerns about the proposal,” said Tara Kelley, MAS’s vice president of policy and programs. In addition to concerns about the integrity of the building, the group is also worried about the accessibility of the POPS. The redesign project team presented its plans to MAS recently, and the group’s planning and preservation committee is meeting with stakeholders again soon for further discussion.